This set of moonshine stills is a complete wine making distillery kit; it is very easy to be set up and use, and we have test everything when we sending the package out. After cooling the steam will generate the distilled water. if you put the Wine materials,it will generate the wine. 2. You can place up to 10-12 liters of raw material and 10-12 Liters can distill about 5-6 pounds of wine;This item need heat and it can heat by Induction or Stove. We boiler and cooler have a little water ,because when we shipping out,we already test everything. In order to have better effect, please distill water for the first time after receiving. 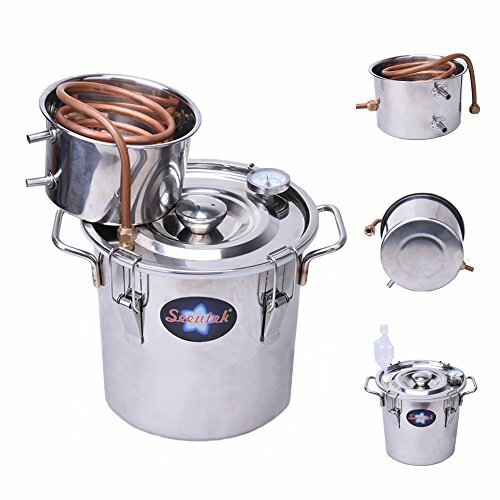 Water distiller,material: red copper + stainless steel,stable when heat on top of the induction cooker or stove.Dimensions:capacity: 3 Gallons / 12L,height and diameter is 26cm/10.2inch x 27.5cm/10.8inch for big still barrel, diameter 18cm/7.6inch and height 11cm/4.3 inch for small cooling pot. 3 Gallon multipurpose usage: You can use your copper ethanol still in different ways. Copper column distiller can be used for hydro distillation, steam distillation and for distilling alcohol.Makes all your favorite drink items in the moonshine copper still such as whiskey, scotch, rum, bourbon, tequila, vodka,essential oils too.